SAN DIEGO--(BUSINESS WIRE)--Mar 22, 2019--Kyocera International, Inc., the leader in rugged mobile solutions, today announced that its military-grade rugged DuraForce PRO 2, a 4G LTE Android smartphone, has been added to its rugged devices available through AT&T. Designed for public safety and enterprise use, especially first responders and construction, DuraForce PRO 2 is dependable and durable in even the harshest environments. DuraForce PRO 2 is also FirstNet Ready™, so it’s been tested and certified to operate on FirstNet – the nationwide public safety broadband communications platform. FirstNet is being built with AT&T in a public-private partnership with the First Responder Network Authority (FirstNet Authority) – an independent agency within the federal government. It’s designed for first responders and those critical to their emergency response. The FirstNet Ready™ DuraForce PRO 2 supports the FirstNet Band 14 spectrum and with a FirstNet SIM gives public safety access to the dedicated, physically separate FirstNet network core, which supports First Priority™, enabling priority and, for first responders, preemption. Engineered with Japanese precision and quality, DuraForce PRO 2 boasts IP68 waterproof and dust proof certification (to 2m/6.5ft deep for up to 30 minutes) and Military Standard 810G for protection against shock, vibration, temperature extremes, blowing rain, low pressure, solar radiation, salt fog, humidity, immersion, temperature shock and icing/freezing rain. The phone’s display is protected by Dragontrail™ PRO, a scratch and crack-resistant glass. Certified Non-Incendive, Class I, Division 2 (Group A-D, T4), the device is ideal for plant and field operations needing durability and safety where concentrations of flammable gas, vapors or mists are not normally present in explosive concentrations but may exist. DuraForce PRO 2 supports HD Voice and Wi-Fi calling and is Android Enterprise Recommended, making it a reliable enterprise solution. Supported by an assortment of accessories, DuraForce PRO 2 can be equipped for a variety of tasks for business or public safety. The phone’s loud 106dB dual front speakers and four noise cancelling mics feature Qualcomm® Fluence PRO™ technology, making Enhanced Push-To-Talk (EPTT) calls (via the dedicated EPTT button), speakerphone use, music, and calls crystal clear regardless of background noise. The 3240mAh Li-Ion battery, Qi wireless charging, and USB Type-C fast charging help ensure DuraForce PRO 2 is always up and running when needed. DuraForce PRO 2 ’s enhanced security features include a biometric fingerprint sensor built into the power button, Secure Device Encryption with FIPS 140-2 and more. Its gloved and wet screen operation ensure the device can be used in cold, wet or muddy conditions. With up to double the ROM/RAM of previous versions (64GB/4GB and supports up to 512GB microSD) and a Qualcomm® Snapdragon™ processor with 2.2GHz x 1.8GHz Octa Core CPU, this smartphone can keep up with the busiest work and disaster environments. Three cameras, 13MP rear, 5MP front, and a super-wide view 4K action camera – all underwater safe and compatible with action-camera mounts, easy on-screen prompts and watertight side keys – help ensure every moment is captured from various angles even in floods or other water emergencies. A new action overlay allows users to record extreme action and rescues with an overlaid speedometer and other data visible, including altitude, G-force, distance and more. Improved auto focus and adaptive HDR imaging help ensure a shot is never missed. The 13MP rear and 4K action cameras are protected by Kyocera’s proprietary Sapphire Shield technology, making them virtually scratchproof. AT&T customers and FirstNet subscribers can purchase Kyocera’s DuraForce PRO 2 today for $15 per month on AT&T Next® pricing (for 30 months), $169.99 with a two-year commitment or $449.99, making it one of the most cost-effective options for a rugged device. All payment options include the two-year manufacturer’s standard warranty. 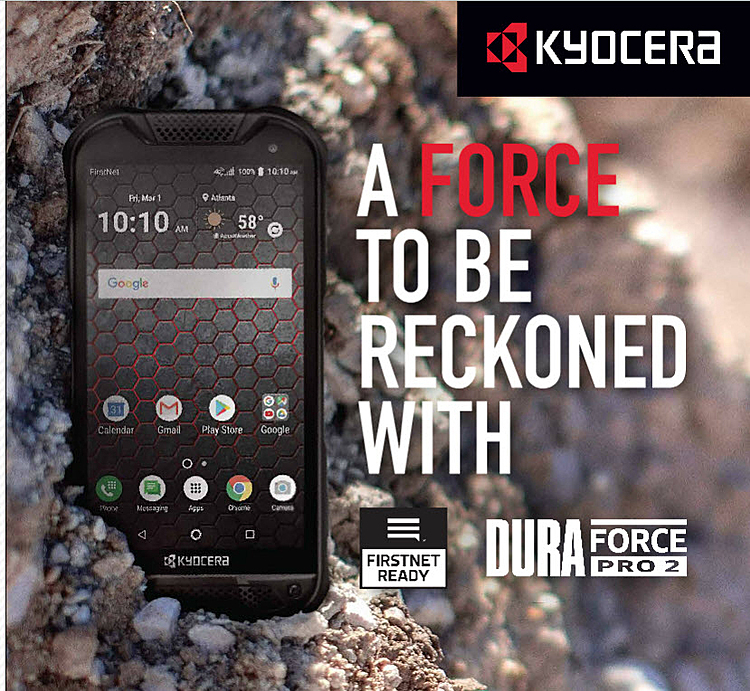 For more information and detailed device specifications, please visit http://www.kyoceramobile.com/duraforce-pro-2/. Kyocera International, Inc.’s Communications Equipment Group (CEG) is the headquarters for Kyocera wireless devices in the Americas. Designed with durability, dependability, and long-term value as priorities, Kyocera mobile phones help people feel comfortable with new technology and use it to connect, perform and outsmart life and work challenges. At the heart of Kyocera's products is a belief that one size doesn't fit all, and that people should do more with phones instead of being confused by them or having to alter their lifestyles to accommodate them. Kyocera strives to offer rugged devices as an integral part of a total solution for a wide range of industries such as public safety, transportation and construction. Joined by an ever-growing list of application and accessory partners, Kyocera provides tremendous flexibility in creating efficient and economical telecommunication solutions for varied enterprise needs. For more information, follow the company at facebook.com/kyoceramobile, linkedin.com/company/kyoceramobile, Instagram.com/kyoceramobile, and twitter.com/kyoceramobile. Kyocera Corporation (tokyo:6971) ( https://global.kyocera.com/ ), the parent and global headquarters of the Kyocera Group, was founded in 1959 as a producer of fine ceramics (also known as “advanced ceramics”). By combining these engineered materials with metals and integrating them with other technologies, Kyocera has become a leading supplier of industrial and automotive components, semiconductor packages, electronic devices, mobile phones, printers, copiers and solar power generating systems. During the year ended March 31, 2018, the company’s sales revenue totaled 1.58 trillion yen (approx. USD14.9 billion). Kyocera appears on the “Top 100 Global Innovators” list by Clarivate Analytics and is ranked #612 on Forbes magazine’s 2018 “Global 2000” list of the world’s largest publicly traded companies. © 2019 Kyocera. All rights reserved. Kyocera is a registered trademark of Kyocera Corporation. Android is a trademark of Google Inc.; use of this trademark is subject toGoogle Permissions. LTE is a trademark of ETSI. All other marks are properties of their respective owners.